Tammy Hall lives in Charlotte, VT on a dairy farm with her husband, Jeff, and their 3 children, Kristopher, Nathan and Aryn. 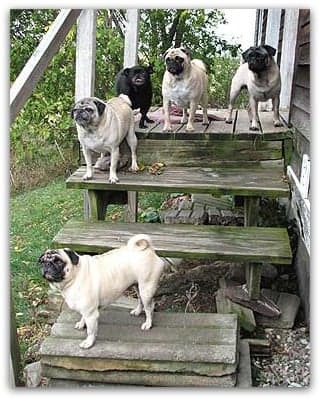 Tammy was a cat lover until she discovered pugs 5 years ago. She fell instantly in love with the breed and feels blessed to share her life with her 5 pugs , Macallister age 4, Hope and Angel (6), Dixie (8) and Noah (1). Tammy has always been a "rescuer" since she was a child. In her spare time, Tammy makes quilts. Often they are made with a pug theme.